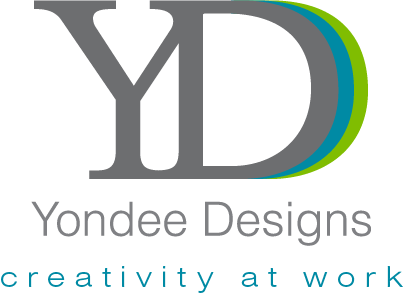 I often get asked, "What does Yondee mean?" In 2005, when I was starting my freelance business, I spent a long time deciding on the perfect name. It had to be unique, personal to me and a reflection of my company. Yondola is my maiden name and Yondee is a nickname from my college days. Yondee represents my whimsical, creative, and fun side. Experience is key. The past seventeen years have been all graphic design…all the time! I graduated from James Madison University with a major in Media Arts & Design and double minor in Marketing and Fine Art. I jumped right into the business world as a Graphic Design Specialist for Circuit City’s Corporate Headquarters in Richmond, VA. I gained valuable experience from a team of 20 designers—all of us supporting print design for internal communications. After 3 years in the corporate world, I moved a few hours north to Leesburg, VA. The association world was my next stop. What a rewarding experience! As the Manager of Creative Services, and only graphic designer supporting a staff of more than 40 employees, I learned to take more responsibility, continue innovative designs from concept to production, and manage print and mail vendors. I watched myself evolve into an expert and began to take on freelance on the side as a hobby. That hobby became a full-time job in 2007 when I decided to take the plunge and go out on my own completely. Whether it be for a company or an individual—I pride myself on providing custom, imaginative designs that will really wow you. When I'm not running a business, you can find me running after my 3 young boys! I feel grateful to have the best of both worlds--a mom and career woman. My sons share my passion for art and their creativity makes me grin from ear to ear. My husband is my biggest cheerleader and is often the voice of the customer as I run ideas by him.